And, may I add to this definition, super duper flavorful?! 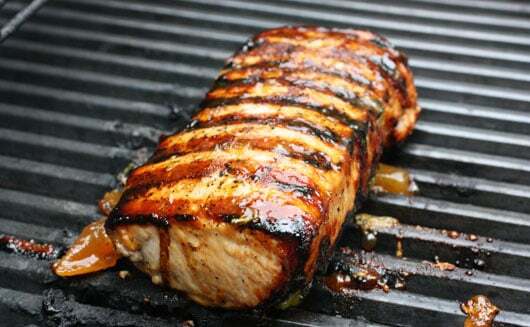 The orange-habanero mojo strewn across this grilled pork tenderloin has so much going on. 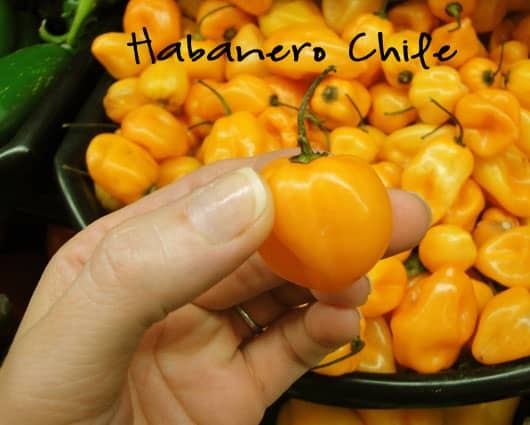 A bright citrusy yumminess, some oniony-garlicky goodness, a touch of habanero heat. Trust me, it’s fantastic. 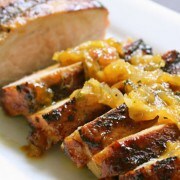 Now layer that mojo over a perfectly moist and delicious grilled pork tenderloin that has been glazed in a sticky, sweet peach sauce…oh, baby! Words cannot describe. 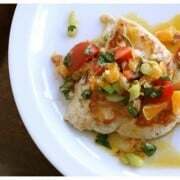 The recipe comes from Bobby Flay’s “Boy Gets Grill”, a cookbook packed with recipes we return to over and over again. If you’re looking for some fun, interesting, and mega flavorful grilling, you will not be disappointed with what Bobby pumps out. This is definitely one of my favorite meals that we make at home. It does have a number of steps to it, but none of it is difficult, so please don’t let that stop you from enjoying this incredible dish. 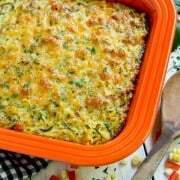 It works great for entertaining, as the glaze and mojo can be prepared ahead of time, and the presentation is beautiful and fun. And if you have some mojo left over (we always do), do not throw it away! 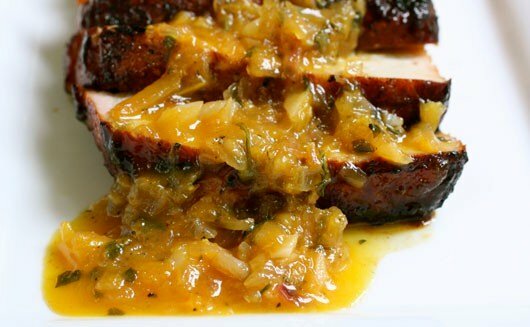 We found that it makes a wonderful glaze for a grilled ham steak. We especially love the ham steaks from Hagberg’s in Lake Elmo. They’re a bit smokey and taste the way ham is meant to taste! And with that, our word lesson here today is done. Happy grilling! 1. Heat your grill to high. 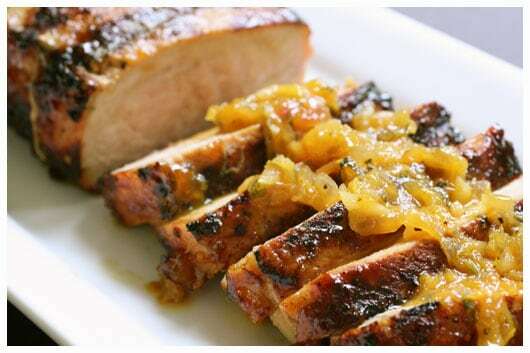 Set aside a few tablespoons of peach glaze for brushing the cooked pork at the end. 2. Brush the pork with oil and sprinkle with salt and pepper. Grill 5 to 6 minutes per side to sear. Don’t peek! Back off the heat to medium-high. Every 3 minutes, brush with the glaze and flip, for 15 minutes. Total cooking time should be 25 to 27 minutes. Use an instant-read meat thermometer to check your temperature. Blake pulls the tenderloins off when they reach an internal temperature of 155° or so, which is under the recommended guidelines for pork. But the meat will continue to cook as it rests in the next step. This will ensure a very juicy tenderloin. 3. Remove the pork from the grill, brush with the reserved peach glaze, and let rest for 10 minutes to let the juices settle in and the meat further cook. 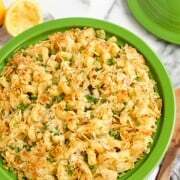 Cut into 1/2″-thick slices and arrange on a serving platter. Drizzle with habanero mojo and serve immediately.